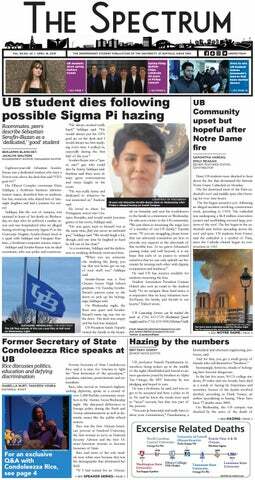 April is one of the most confusing months for UB students. The end of the semester is nearing but students also have to be on the work grind. And it’s hard not to be distracted by the fact that the weather is no longer a polar war zone. Students have already begun wearing shorts and tank tops on days where it barely reaches 50 degrees, so this trend will only escalate as the nice weather – and increasingly busy schedules – builds. If you’re looking for something to do to distract from gawking over the fact that the sun has started to exist again but you have to be stuck in the library, here’s a small portion of what’s going on in Buffalo this month. Ashley Powell will be hosting a talk on April 1 at the Buen Vivir Gallery at 148 Elmwood Avenue. Powell, a UB graduate fine arts students, is known for her controversial “White Only” art project in September, which stirred conversation about race and freedom of expression at UB as well as across the nation. Powell will discuss her work in relation to environmental racism that occurred with the Flint, Michigan water crises as well as racism that occurs in the Buffalo area. Those who are looking for an event that ties into bigger issues that the country is facing right now might enjoy Powell’s talk. The event is free. For students who are new to the area or those that just don’t leave campus much, it can be hard to find a new place to eat. There are a lot of easy-to-find fast food places close to campus, but most fast food doesn’t offer the same cultural flare that local restaurants do. Like the name implies, Local Restaurant Week seeks to inform people in the Buffalo area about the independently owned restaurants in the Western New York area. It takes place from April 11-17. More than 200 local restaurants will participate in the event with meals priced at $20.16, $30.16 and $40.16 for every restaurant participating. Take a break from school and get a taste – literally – of what Buffalo has to offer. The weather isn’t the only thing that’s starting to heat up this time of year. Now that it’s warm enough to stand outside without icicles forming on your body, food truck grilles are also getting hot. Whether you go for Buffalo mac and cheese or tacos, food trucks offer some of the most deliciously unhealthy meals out there. Food Truck Tuesdays take place every Tuesday from 5-8 p.m. in Larkin Square in downtown Buffalo and offers a variety of different venders from the Buffalo area. With work piling up and finals getting closer by the day, it can be hard to find time to relax and unwind. A great way to decompress that doesn’t involve food is comedy. The Comedy Get Down, which takes place April 23 at First Niagara Center, will feature five different comedians: Cedric “The Entertainer,” known for his role in “Barbershop”; Eddie Griffin, known for his role in “Def Jam Comedy”; D.L. Hughley, from “The Hughleys”; George Lopez, from “Lopez Tonight” and the sitcom “George Lopez”; and Charlie Murphy from “The Chappelle Show.”Tickets range from $49.75-65.75. If you’re not a fan of the artists coming to UB’s Spring Fest, which is the same day, check out this comedy event. And if you end up crying during the show from how stressed you are, you can just say they were tears of laughter and no one will judge you – unless it’s during intermission.